The automotive industry is witnessing massive transformation driven by digitalization and the proliferation of ’connected’ in-car devices. With high performance electronics in small factors embedded into the modern automotive, modern cars are transforming into sophisticated digital machine that can communicate seamlessly with the outside world. Aware of the tremendous business value around the idea of connected car experiences, more technology companies are partnering with automotive manufacturers. Equipped with the latest automotive technology that provide a digital and interactive interface to the various systems, including the in-vehicle infotainment and telematics, car manufacturers and fleet operators can not only manage a vast number of vehicles and maintain their peak performance, but also increase efficiency and lower the maintenance cost. Tier 1 suppliers on the other hand can leverage digital identity of the users to deliver personalized experience to the driver and the passengers. There are several technology companies that are at the leading edge of enabling automotive transformation, helping auto manufacturers and Tier 1 suppliers to leverage the digital trend. In an effort to facilitate the CIOs find the right automotive technology partner, a panel of prominent CEOs, CIOs, VCs, analysts, along with the CIOReview editorial board has assessed scores of automotive technology solution providers and picked best performing companies. We have considered the company’s ability in designing and building advanced automotive solutions that cater to the needs of the auto manufacturers and Tier 1 suppliers. 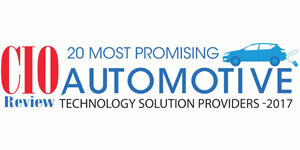 We present to you CIOReview’s 20 Most Promising Automotive Technology Solution Providers - 2017.